When working on a PCS application, you save and publish your changes often. However, when you publish a certain state of the application, you can decide to create a snapshot of this state of the application. This can be very helpful if the publish represents a certain version of the application. Later these snapshots can be deployed or reverted to in case you want to roll back to a previous version. It is also possible to see what was in the application at the time of the snapshot creation. In this blog we will show you how to work with snapshots. 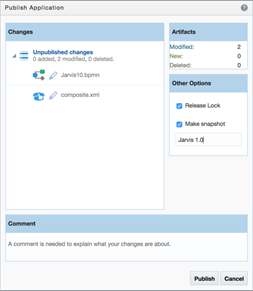 When publishing, in the popup on the right hand side there is an option to ‘Make Snapshot’, when this checkbox is checked you can enter a name for the snapshot, in this case the snapshot will represent Jarvis 1.0! Read the complete article here.